Prepare the marinade: In a large bowl, whisk together first 9 ingredients. Place salmon, flesh-side down in the marinade, gently pressing salmon down to ensure that all of it is covered in marinade. Allow to marinate in refrigerator for 30 minutes. Prepare the rice: In a large saucepan, add stock, rice and salt and pepper, to taste. Bring to a boil over medium heat. Reduce the heat and simmer uncovered for 15 minutes. Cover and simmer, stirring occasionally, until the rice is tender and is beginning to split, about 30-40 minutes. Remove from heat and drain rice of any excess liquid. Fold in cherries, pepitas and parsley. Taste for seasoning and adjust if necessary. 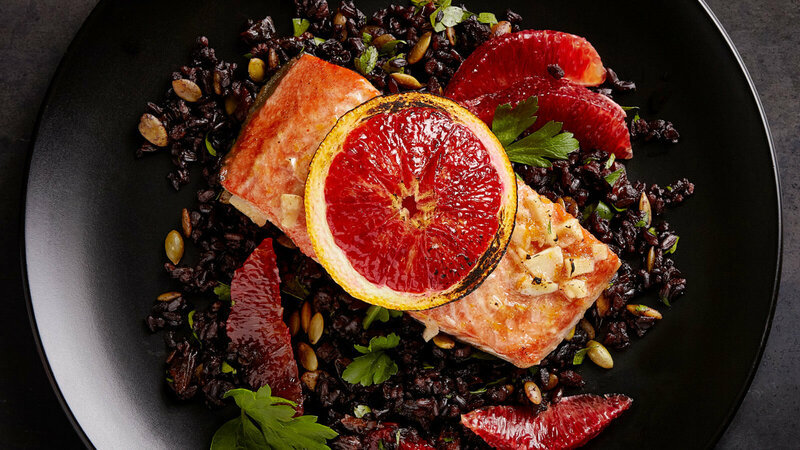 Transfer the rice to a serving bowl and top with blood orange supremes*. Preheat oven to 400°F. Place fillets, skin-side down in a parchment-lined glass baking dish. Pour remaining marinade over and top each fillet and top with 1-2 slices of blood orange. Bake for 10-12 minutes, or until fish is cooked to desired doneness. Serve salmon fillets over rice. *Click here to view our step-by-step guide on how to supreme citrus.